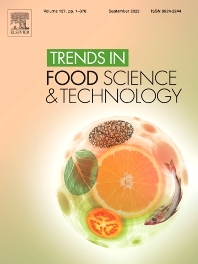 Trends in Food Science & Technology is one of the premier international peer-reviewed journals publishing critical reviews and commentaries of current technology, food science and human nutrition. Its role is to fill the gap between the specialized primary journals and general trade magazines by focusing on the most promising new research developments and their current and potential food industry applications in a readable, scientifically rigorous way. Topics include new or novel raw materials including bioactive compounds, ingredients and technologies; molecular, micro- and macro-structure; new developments in food engineering; rapid techniques for online control; novel processing and packaging technologies; advanced biotechnological and nanoscience developments and applications in food research; quality assurance methods and application of -omics techniques; risk assessment of both biological and non-biological hazards in food; food allergies and intolerances; food function and relationships between diet and disease; and consumer attitudes to food and risk assessment. Issues include a selection of Reviews, Commentaries, Conference Reports and Book Reviews, plus a calendar of upcoming conferences, courses and exhibitions. It does not publish research papers.